Baby Mobs Mod 1.11.2/1.10.2 adds baby versions of many vanilla monsters, each with its own special abilities. These baby mobs replace their adult mob versions when they spawn, at a certain rate. Most baby mobs have similar characteristics to the Vanilla Baby Zombie and Baby Zombie Pigman: they have increased speed, increased experience drops, and their nearby adult counterparts will become aggressive towards you if you attack them. These baby mobs will also follow their adult counterparts if they are nearby. The Baby Blaze will shoot a flamethrower if you get too close to him. Approach with caution! The Baby Cave Spider will spit poisonous venom at you from a distance. It can also spawn a cobweb on you to keep you from running away! The cobweb will disappear over time or can be broken with a sword or shears. The Baby Creeper should be pretty noticeable as he spits out more and more sparks as he gets closer to exploding. When he does explode, he also shoots out larger sparks that will light you on fire if they hit you. The Baby Dragon is a very small version of the Ender Dragon. It will spawn when a Dragon Egg is placed, spawning particles and flying around the egg. The Baby Dragon cannot be interacted with. If spawned without a Dragon Egg using cheats, it will fly around similar to the Ender Dragon. The Baby Enderman dislikes being looked at even more than the Vanilla Enderman does. It will target anyone that looks at it and shoot a laser beam! Baby Ghast: Great Balls of Fire! The Baby Ghast will shoot large, flaming fireballs that explode into a burst of embers on contact. Baby Guardians will not only inflict thorns damage when they’re attacked, like the Vanilla Guardian, but they will also push out their spikes for a short while. This protects them from damage slightly and will hurt anyone that gets too close! Baby Iron Golem: The Cure to Zombie-ness! A Baby Iron Golem spawn normally in villages or can be spawned by placing a pumpkin on top of an iron block. The Baby Iron Golem spawns with a poppy and will give it to Zombie Villagers to turn them back into normal Villagers. They also plant their poppies occasionally. The Baby Ocelot spawns accompanying a Baby Witch. The Baby Ocelot will follow the Baby Witch and will attack any players that get too close. The Baby Ocelot is also immune to any potions that a Witch throws. The Baby Skeleton spawns with a random potion effect (nausea, poison, wither, blindness, or slowness) inflicting it and its arrows. The effect that the Baby Skeleton has can be seen by the colored particles it and its arrows give off. You will be inflicted with its effect if you attack the skeleton or if you touch of its arrows. The Baby Snow Golem can create a snow layer beneath it like the Vanilla Snow Golem, but it also freezes any water that it steps on as well. The snowballs that the Baby Snow Golem throws also have a freezing effect on impact that gives a slowness effect. The Baby Spider can also spawn a cobweb on you to keep you from running away! The cobweb will disappear over time or can be broken with a sword or shears. The Baby Squid will release a puff of ink, that will blind anyone that swims in it, when it is attacked in water. No witch is complete without her faithful black cat companion, right? The Baby Witch will spawn a black Baby Ocelot that will follow it and attack any player that gets too close. 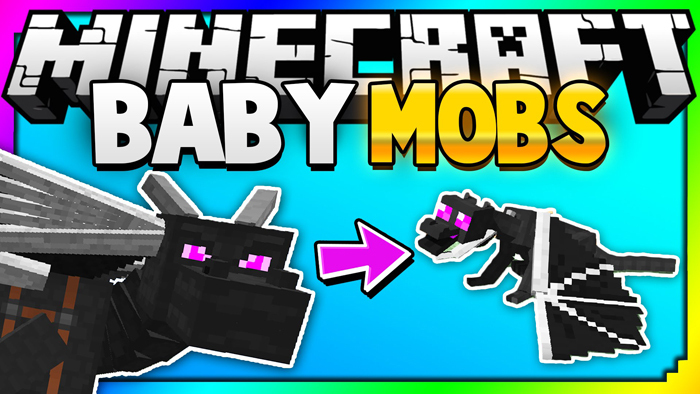 Baby Wither: Easy Nether Stars! The Baby Wither can be spawned by placing a Wither Skull on top of a block of Soul Sand. Since it only takes one skull to summon it, the Baby Wither will not always drop a Nether Star. If it doesn’t, it will drop another Wither Skull instead. The Baby Wither’s attack will explode into smaller wither particles on impact. During the Baby Wither’s armored phase, not only do arrows not hurt it, but it will also deflect them right back at you! The Baby Wither Skeleton has had enough with players always trying to steal its Wither Skull, so it will run away from players as fast as its little legs can take it. The Baby Wither Skeleton will use the magic of the Wither Skull to damage and escape from any pursuing players. If you do manage to find and defeat one, they have a much higher drop rate of their Wither Skull than their Vanilla Wither Skeleton counterparts.